My Own Private Cellar can help you start a new wine cellar, make-over your wine cellar, or round it out to include a wider variety of regions, vintages or types of wine. My Own Private Cellar also provides wine cellar cataloging and evaluation and cellar valuation for insurance purposes. My Own Private Cellar recommends and uses state of the art software, which provides clients with an on-line inventory of all wines, drink-by dates, start-drinking dates, wine ratings, expert and general tasting notes, and food & wine pairing suggestions. “The other night as I was dashing in and out of home between work and dinner at a friend's home, I was plagued once again by the ever recurring question "What wine do I take?". Fortunately I didn't have to think too long about it on this occasion as I quickly recalled that since engaging Shawn to catalogue my cellar, such dilemmas were a thing of the past. I had only to take a look at the "drink by" list to know in which corner of my cellar I needed to look for the most appropriate bottle. Choosing a wine for a dinner party, a quiet evening on my own after work or to take as a gift is no longer blind guessing but an informed decision chez moi! Shawn O'Hara brought her sommelier training and research of relevant websites into my home one day when I was at work. She catalogued all my wine and uploaded it onto a useful and largely free website which I can now manage on my own from home or on the road. 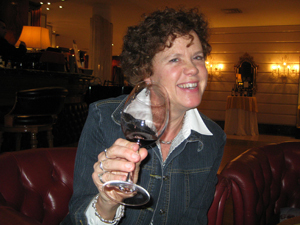 She taught me how to use the site and how to think about consuming wine. She then proceeded to make recommendations about how I could improve my cellar and also increase the pleasure of wine consumption by selecting the right wines for the right occasions (both a matter of finances as well as taste!) and has researched and located sources of wine to complement or replace the wines in my cellar. I am a single, professional woman with high expectations in most areas of my life and little time to spend on anything. I have a good assistant at work and household help for the daily basics as well as personal administration and I don't mind paying good money to get the help that I need to allow me to enjoy my limited leisure time to the maximum. I don't yet have a personal fitness trainer but I do have a private sommelier and can highly recommend this addition to the service portfolio of anyone in my situation who knows that a small investment in the right knowledge and assistance can make work-life balance so much better and lead to a greater appreciation and enjoyment of the finer things in life.